The F region in the MLHs III includes the sites located between the Rivers Ebro and Mínguez (tributary of the Júcar), a territory which roughly corresponds to the current Spanish provinces of Castellón and Valencia and which the classical authors attribute to the Edetani and Ilercavones, the former in the south and the latter in the north. Zone G is found south of the River Mínguez and characterised by having inscriptions in the Greco-Iberian alphabet and in southern Iberian script. In total, Iberian inscriptions have been recovered at sixty-seven sites. The most numerous collections are those of Sagunto (V.04, more than sixty inscriptions) and Liria (more than a hundred inscriptions), both exceptional, the former because it includes the most extensive series of Iberian inscriptions on stone and the latter that of tituli picti on ceramics. There are also several very notable lead groups, of which the most noteworthy is the collection from of Orleyl (CS.21) with around ten plates, followed by other lesser collections in Los Villares (V.07), in El Pico de los Ajos (V.13), in La Carencia (V.14) and in La Balaguera de Pobla Tornesa (CS.13). Several examples have also been recovered in Sagunto and in El Tossal de San Miquel, with, finally, other isolated findings: Pujol de Gasset (CS.14.01), El Solaig in Bechí (CS.18.01), Casinos (V.02.02), Castellet de Bernabé (V.06.001), Meca (V.15.02), Enguera (V.16.01) and Tos Pelat in Moncada (V.21.01). 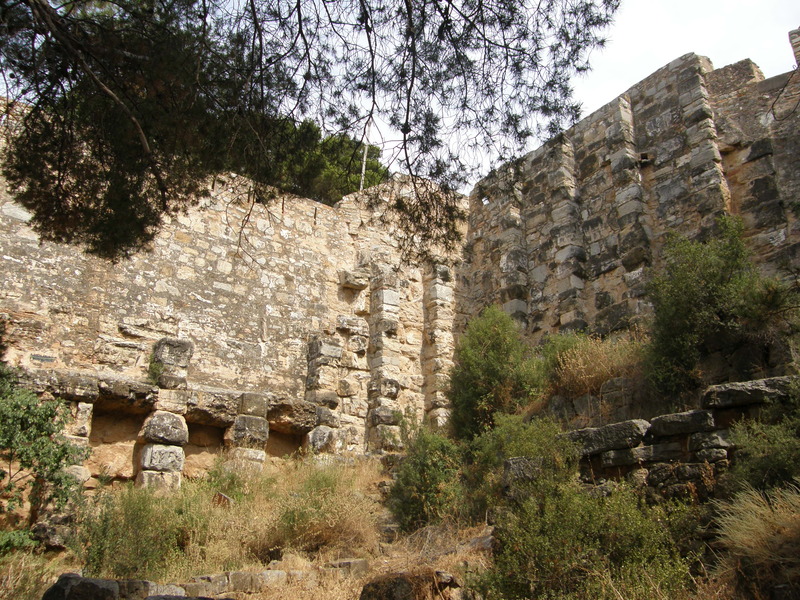 The sites with most inscriptions are acknowledged for their size as cities, some of them identified with those that mention classical sources and/or with mints: Sagunto castle is identified with Saguntum, the mint of arse (Mon.33), in the Palancia Valley; Sant Miquel de Lliria with Edeta, in the Turia Valley; La Carencia de Turís in the Magro Valley, which, it has been suggested, is identified with the mint of kili (Mon.34); and Los Villares, located at the headwaters of the Magro, which is identified with the mint of kelin (Mon.94); and to the south of the Júcar is Játiva, called Saetabis in Latin sources and the mint of saitabi (Mon.35). Lessera, identified with Moleta dels Frares, Forcall (CS.23), is in the zone of the Maestrazgo. The Latin colony of Valentia (V.12), which minted coins with Latin legends and where Latin, Greek and Iberian scripts have been recovered, was founded at the mouth of the Turia. The most important collection of inscriptions on stone comes from Sagunto (V.04), which includes steles, blocks and plaques; in the nearby Montaña Frontera sanctuary a group of small pedestals for statuettes has been recovered. The rest of the inscriptions on stone are steles from the Maestrazgo zone: Canet lo Roig (CS.01), San Mateu (CS.04), Benasal (CS.05), Cuevas de Vinromá (CS.07), Alcalá de Chivert (CS.08), Bell-lloc (CS.10) and Cabanes (CS.11). Finally, there is a group of rock sgraffiti in the Tarragón (V.24), in the Andilla mountain range, and another in Abrigo Brugal (V.10). The inscriptions painted on ceramics, especially lebes and kalathoi, are characteristic of Sant Miquel de Llíria, a site at which one of the most significant collections of Iberian ceramics painted with a figurative decoration has been discovered. 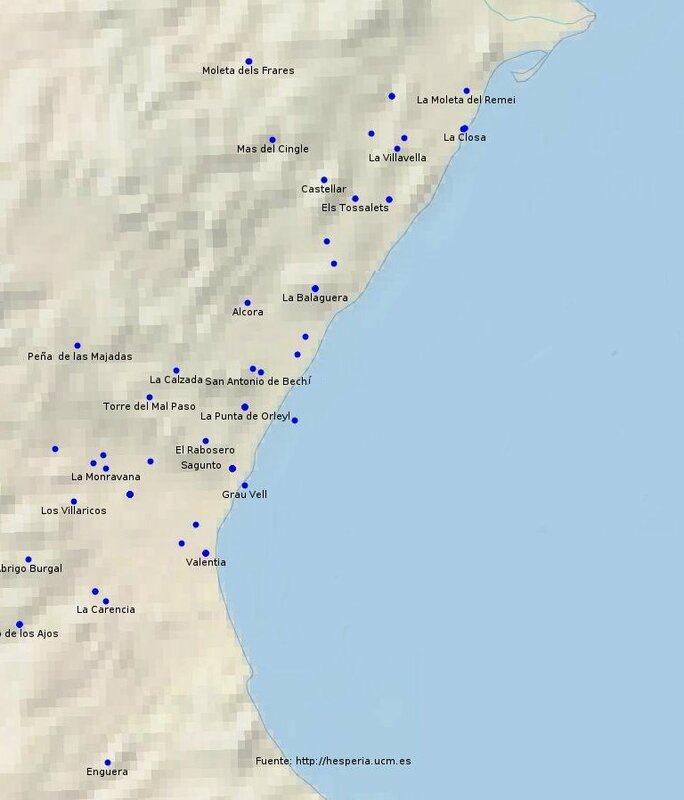 At the surrounding sites, isolated findings are documented: Casinos (V.02.01), Los Villaricos (V.05.01), Castellet de Bernabé (V.06.002), La Monravana (V.06.005) and also at Los Villares (V.07.06-07). The longest Iberian texts are engraved on lead sheets. A significant number come from casual discoveries, such as the Pujol de Gasset lead (CS.14.01) and most of those in Orleyl, but three of those which come from this municipality appeared, however, in the excavation of a tomb in the necropolis of La Punta (CS.21.05-07). Three leads, with writing on both sides and on several of which several texts are superimposed on one another in palimpsest style (V.13.3), were recovered simultaneously in Pico de los Ajos. Some examples are also known which are not fashionable sheets and that could have served in some cases as labels, such as a circular perforated piece in Los Villares (V.07.04). The scarce number of graffiti on ceramics is surprising, if compared to other regions such as B, C and E, where they are the most typical form of epigraph. The most numerous groups come from Sant Miquel de Llíria (V.06), Sagunto (V.04) and Valencia (V.12). Only two stamps on ceramics are documented, both of loom weights from Sagunto (V.04.19-20). Finally, there are exceptional inscriptions, such as the bronze plaque of San Antonio de Bechí (CS.18.02), the inscribed falcata of Torres-Torres (V.22.1) and the bone pieces of Peña de las Majadas (CS.16.01) and Puntal dels Llops (V.03.01). See the table with the Hesperia reference list used for this zone F.
The oldest inscription is the lead of Grau Vell, port of Sagunto (V.04.61), which dates to between the end of the 5th century B.C. and beginning of the 4th century B.C. ; a graffito on an Attic ceramic from the 4th century B.C. (V.04.47) has also been recovered from this site. The three leads in tomb 2 of the necropolis in Punta de Orleyl (CS.21.05-07) probably date from the 3rd century B.C. Equally, the tituli picti also dated from the 3rd century B.C., since the site of San Miquel de Llíria was destroyed at the end of that same century or beginning of the following one. Among the mints, the early establishment of arse (Mon.33) stands out, while kili (Mon.34) and kelin (Mon.94) did not mint until the late Iberian period (second and first centuries B.C.). Some Iberian-Latin inscriptions are documented. Several mints minted with their toponym in Iberian and Latin: śaiti/SAETABI (Mon.35), kili/GILI (Mon.34) and arse/SAGVNTINV; in the latter city there is also an architrave with a dual inscription in Iberian and Latin (V.04.08). All these examples are from an advanced era: the first century B.C. The most modern epigraph would be the short graffito engraved on a southern Gaulish terra sigillata in Vinaroz (CS.02.03). The border between regions F and G is marked by a preponderance in the latter of inscriptions in southern Iberian script and in Greco-Iberian alphabet, while in F the Levantine Iberian script is used. Nevertheless, a Greco-Iberian lead has been published which appears to come from Sagunto (V.04.29) and there are also two leads from the region F written in southern script, one in Pico de los Ajos (V.13.06) and another in Turís (V.14.02). In the case of inscriptions written in the Levantine Iberian script, it is not always possible to determine if they employ or not the dual system. The discovery of three inscriptions which include dual ABCs is very significant, in that the signs are grouped in pairs of simple and marked out allographs: they are the leads of Tos Pelat (V.21.01, .02) and the titulus pictus of Castellet de Bernabé (V.06.003). The use of the dual system is easier to determine in longer texts, given that they allow one to corroborate the presence of simple and complex variants in the same syllabary. It can be affirmed that it is used on several leads, such as those of Los Villares (V.07.01-02), while in the case of shorter texts it is difficult to determine, although some are compatible with the aforementioned dual system. According to the convention followed in Hesperia for other zones, such as that of Narbonne (as explained here), if the inscription uses a complex allograph in the transcription it is marked with an accent, for example: ká, ké, kí, etc. The painted inscriptions of Liria, for their part, present a very characteristic palaeography, with an abundant use of more complex variants in the marks signs, more stylised and curvilinear forms -thanks to the use of the painting technique- and interpunctions made up of three or more points. Given that we do not have a unitary corpus of each epigraphic variant in Levantine or Northeast Iberian script –which is being developed— the epigraphic comments in the inscriptions file belonging to region F refer to the variants established by Untermann in volume III:1 of the MLHs, pp. 246-247. We transcribe them below for the convenience of the reader: Levantine or Northeast script. Sites in epigraphic zone F with their Hesperia reference. Simple map: click on the site of Sagunto to see photos of the site.